Your first impression of Bloodhounds may stem from that lazy beast featured on The Beverly Hillbillies TV sitcom, but don't be misled. This is a hard working, heroic breed of dog. You might assume Bloodhounds are a staple of the American south because of their frequent portrayal in films and on television, but this isn't the case. This breed is actually the product of French nobleman who bred them, along with their dwarf cousins the Basset Hounds, to accompany their masters on the hunt. A scent hound by nature, the Bloodhound is known for its amazing ability to track its quarry over hundreds of miles, but the breed wasn't used for tracking humans until about the sixteenth century. Today, the noble Bloodhound is the breed of choice for law enforcement and search and rescue workers, using his incomparable talents to find fugitives and victims alike. The key to the Bloodhound's superior ability to track by scent lies in its enlarged olfactory system. Dogs in general have the ability to recognize scents that humans can't detect. This is due to the large number of receptors located in their nasal passages. The larger the passages, the greater a canine's ability to detect the scent, as you can see, Bloodhounds have very large noses and muzzles. The Bloodhound's ears and jowl flaps also play a vital role in scent detection, capturing and collecting scents to be delivered to the nasal chambers for analysis. 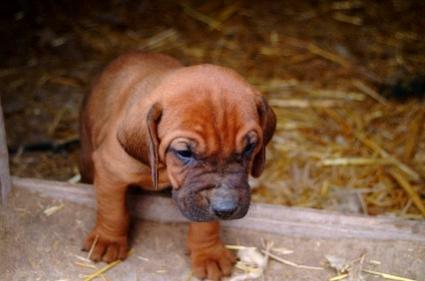 Bloodhounds have been known to pick up the human scent on trails that are several days old. This is because humans shed dead skin cells on a continuous basis, and even though they are microscopic, this breed only needs to find one or two to pick up the chase. These are large hounds weighing in around one hundred pounds. They have long ears, droopy eyes and numerous folds of skin. Their lengthy tails are held flagging over their backs. A small amount of white fur is permissible on the chest and feet. The Bloodhound is one of the best natured canines you will ever meet, and they become deeply devoted to their human companions. Although not the most active of dogs as adults, these hounds make up in perseverance what they lack in speed and agility. Once on the tracking trail, it's nearly impossible to persuade a bloodhound to give up the chase. This has given the breed an unfair reputation for being a bit stubborn, but in all fairness they are really just very determined to do the job they have been bred for over the last one thousand years. On the other hand, puppies of this breed can be quite a challenge to raise and train. They tend to follow their noses straight into trouble, and because their large size makes them quite awkward during their development, they can cause a lot of destruction no matter how good their original intentions were. These dogs can make wonderful family pets, but be careful when you take them for walks. One scent of something particularly interesting and you just might find yourself being pulled along the invisible trail. Bloat, also known as Gastric Torsion- This is a painful condition that cause the stomach to twist closed upon itself, trapping digestive acids and gasses that make the stomach blow up like a balloon. The condition can be fatal if it's not treated in time, and survivors are likely to suffer recurrences. Canine Hip Dysplasia- This degenerative joint disease can be crippling, and in some cases results in the need for euthanasia. This is not the breed for apartment life. These hounds need room to roam and high sturdy fences to keep them contained in the yard. Unless you have a love for the great outdoors and a penchant for hiking, you might just want to admire these dogs from afar. As wonderful as they are, they are not the breed for everyone.